KOOLTRONIC high performance control cabinet Heat Exchangers combine powerful forced-convection cooling with the advantages of a closed-loop cooling system, for environments that contain contaminated ambient (outside) air. The closed-loop design cools and recirculates the same clean air within the enclosure, isolating components from the hostile environment. All KOOLTRONIC Heat Exchangers provide a large heat transfer area in a compact package with high performance air systems for high flow rates and thorough air distribution within the electronics or electrical enclosure. 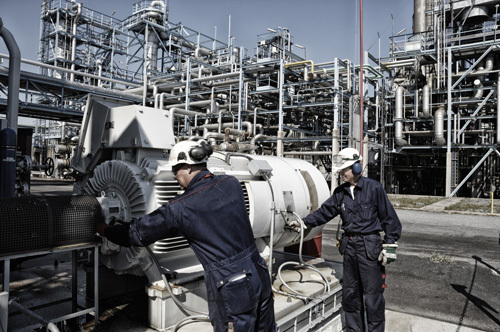 Air-to-Air Heat Exchangers are the ideal choice for applications that can tolerate operating temperatures somewhat higher than ambient. However, if below ambient temperatures are required, we recommend an enclosure air conditioner. Both of these options can be considered for enclosures located in areas where airborne contaminants pose a threat to the internal electronic components, and the enclosure interior must be isolated from the external environment. The KTHE Series features a refrigerant-charged fin-and-tube coil, employing the heat pipe principle. The KXRP, KXHE, KXNP and KNHX Series utilize a high-efficiency convoluted aluminum heat transfer element. These elements provide excellent thermal transfer performance and are easily removed for cleaning. KOOLTRONIC manufactures its own heat exchanger elements. KPHE and KNHE Water-to-Air Heat Exchangers fill the performance gap between Air-to-Air Heat Exchangers and Air Conditioners. If a reliable, clean, cool water supply is available, these units are often the ideal solution when extreme contaminant or temperature conditions are present. The adaptability of KOOLTRONIC Heat Exchangers is increased by flexible mounting orientations and a comprehensive line of accessories and options. Most KOOLTRONIC Heat Exchangers are designed for installation in indoor environments. For outdoor operation, weather protection and other special protective features are required. It is important to note that the use of a standard indoor unit outdoors would invite damage and early component failure, invalidating the KOOLTRONIC warranty. Advantage KXRP Series and Integrity NEMA 4/4X Heat Exchangers are available for outdoor installation or applications requiring wash-down. Most standard KOOLTRONIC Heat Exchangers are UL/CUL Listed and all units feature rugged construction of precision-engineered heavy gauge steel that ensures they will withstand the tough conditions they may encounter. For a more customized application, we offer a full line of enclosure accessories and options to satisfy your enclosure cooling requirements. Some of these accessories include alarms for both temperature and water supply (water-to-air models), low airflow detection, internal corrosion protection and custom shells, such as stainless steel or aluminum. A wide range of replacement filters are also available from our inventory. For electrical enclosures where ambient air can be used for cooling, it is important to consider our enclosure fan and fan tray products, as these units are a highly economical cooling solution, sufficient for many applications. If one of our standard products do not meet your needs, our Engineering staff can also design unique heat exchangers to meet your specifications. We invite you to inquire about our modification and custom-design capabilities. 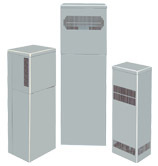 Advantage Series Indoor/Outdoor - Offered in three sizes, 28", 33" and 47" high, with three capacities dissipating from 24 to 54 Watts/°F, these units can be used indoor and outdoor without the need for weather hoods. Standard features include heavy duty galvanized steel construction with baked-on powder paint and epoxy-coated heat exchanger element. TrimLine Series Air-to-Air - Offering four sizes, 33", 36", 47", and 59" high, dissipating 33, 42, 56 and 91 Watts/°F respectively, these narrow, versatile units provide near-ambient cooling in a closed-loop system. 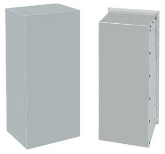 Integrity Series NEMA 4/4X Air-to-Air - These stainless steel units are offered in four sizes, 32", 38", 47" and 59" high, dissipating 21, 44, 54 and 65 Watts/°F respectively. They protect against hazards specified for both indoor and outdoor NEMA 4/4X enclosures. The series is interchangeable with Kooltronic Integrity Series NEMA 4/4X Air Conditioners for flexibility in selection, upgrading or reducing your cooling performance. KXHE Series Air-to-Air - This versatile series offers six sizes, from 22" to 59" high, dissipating from 8 to 88 Watts/°F. These unique units operate effectively when mounted vertically, horizontally, internally or externally. The units use a closed-loop system that provides cooling within sealed electronics or industrial enclosures, making them an ideal choice for use in dirty or oil-laden environments. KNHE Series NEMA 4/4X-Water-to-Air - These NEMA 4/4X Rated units were designed for use in harsh, contaminated environments where frequent cleaning of air filters and the heat exchanger core would be necessary. This Series consists of seven units from 20" to 54" high, dissipating from 20.5 Watts/°F @ 0.25GPM to 215 Watts/°F @ 4GPM. KPHE Series Water-to-Air - This series is available in five sizes, from 20" to 32" high, dissipating from 20 Watts/°F @ 0.25GPM to 112 Watts/°F @ 2GPM. KTHE200 Air-to-Air - These units utilize a refrigerant-charged coil to provide closed-loop cooling while dissipating 17 Watts/°F. The KTHE200 is 17" high and operates efficiently mounted either vertically, horizontally, externally or internally. Outdoor operations require special weather protection and external protective features. Legacy ProductsAlthough we recommend our current products listed on this page, we may still be able to provide you with our older product: the KPHE39 Series.